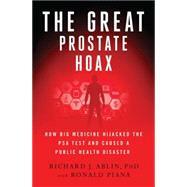 Richard J. Ablin, PhD, DSc (HON) is a professor of Pathology at University of Arizona College of Medicine. In 1970 he identified PSA—the prostate specific antigen that is used as a test for prostate cancer. For decades he has fought against the misuse of his discovery, including a 2010 New York Times op-ed titled “The Great Prostate Mistake.” He lives in Tucson, AZ. Ronald Piana is a science writer specializing in oncology. He edits and writes for ASCO, the publication of the American Society for Clinical Oncology. He lives in Huntington, NY.